Supporters of a Kent clinic which is one of just five in the UK to provide homeopathic treatment on the NHS have met to fight plans to close it. The Homeopathic Hospital, in Tunbridge Wells, treats up to 1,000 patients a year but the primary care trust (PCT) which runs it needs to save £160,000. A public meeting on Tuesday heard how patients had come to rely on the unit. James Thallon, of the South West Kent PCT, said the trust was "critically reviewing every aspect of expenditure". "In order to save the large amounts you need to look at every little last bit on your balance sheet, and we have had to look at homeopathy in that light," the medical director said. He explained that the hospital as a whole was not facing closure, just the homeopathy department. 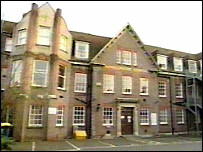 The hospital also houses community paediatrics and a child and adolescent mental health service. Mr Thallon said in future all patients referred for homeopathy would be considered by a special panel to ensure their treatment was appropriate. "Homeopathy has been around since the 18th Century and has got a large body of very convinced adherents, but in the era of evidence-based medicine it's beginning to struggle a little bit, so I'm afraid that we're reflecting this in our decision." Mary Williams, 87, has been going to the hospital for 56 years, where both her mother and grandmother were patients too. She is allergic to some conventional medicines and said: "I'm devastated. I've relied on the hospital... it just mustn't shut down."